Two weeks ago I wrote an article about ‘The Benefits of Gaming’, but after all, this is a Zelda oriented Nintendo site. What fun are analyzing the benefits and negative aspects of general gaming when the reason we’re all here is Nintendo? Well fear not, for the always intended sequel to ‘The Benefits of Gaming’ has arrived. This time around we take a look at what I see as the top five benefits brought to gaming by Nintendo and their renowned franchises. When you look at releases like Wii Fit and Wii Fit Plus along with its balance board peripheral, there is no doubt that Nintendo is encouraging fitness. Indeed, Wii Fit doesn’t necessarily give you a proper workout, but what it does do is make fitness fun and bring it to people in a new way. At the least, it can give people the inspiration to get out and do some real exercise once the fun of the game wears off. In fact, look at other titles in the ‘Wii’ Series: Wii Sports and Sports Resort encourage getting active while gaming. Wii Music also gets players actively involved, and encourages people to get out and learn an instrument for real. Even ‘Wii Play’, while pretty sterile for us oldies, has proven to be great for motor skills in infants. The upcoming Zelda title, Skyward Sword, looks like it will have engaging gameplay that may cause you to break a sweat – not from stress, but from activeness – or maybe not. Nintendo gaming encapsulates all of gaming’s generic motor skill advantages, like increasing reaction times and strengthening finger control, and goes beyond. People are more active in their gameplaying then they ever have been before. Thanks to Nintendo’s innovation, we’ve seen other companies like Microsoft create the Kinect for the Xbox 360, where players literally use their bodies as the controller. Sony’s Playstation Move does similar in encouraging physical activity in its gaming, instead of just hours on the couch, beanbag, bed or floor. Sure, more people may be getting injured because of gaming these days, but such is the risk of becoming active. Compare gaming related injuries to club sport injury figures for each year – gaming is still pretty safe. Added to that, gaming is becoming so much less introvertive than it once was, thanks again to Nintendo. Of course, there are always going to be cases of addiction and people becoming less social, but overall, Nintendo games help to improve social skills. The Wii and DS are all about gaming together – as a family, with friends, with partners. Titles like Mario Kart Wii and Wii Party, right through to Super Smash Bros. Brawl and Super Mario Galaxy allow for one person, two people – right through to many. Modern Nintendo gaming is about bringing groups of people together, not forcing people to go their own ways and play individually. Single player quests are increasingly having co-op modes, like the recent Aragorn’s Quest, to cater to the ‘togetherness’ of modern gaming. The DS likewise allows for great connectivity options, like multiplayer Mario Kart with one cartridge, so friends can play together – friends that never would have otherwise considered gaming in the past. Also consider online gaming and the fact that if it wasn’t for Nintendo gaming we wouldn’t be here at Zelda Informer, where close and lasting friendships have been formed. Believe it or not, gaming is pro-social much more than it is anti-social. Improvements to my own personal qualities and characteristics is also something else that Nintendo gaming brings. No other game platforms or developers have come as close to this as Nintendo does. Persistence, and an ability to stick with things that get tough and must be repeated over and over again – that’s what I’m talking about. Such is life, such is gaming. For me, Tall Trunk Galaxy in Super Mario galaxy 2 is a prime example, but for you it could be anything else. Then there’s problem solving, like we see in the popular Professor Layton series. Puzzles that build mental strength, as do titles such as Brain Training. These days, The Legend of Zelda comes easily to me, but it didn’t at first – it was intense. Both Ocarina of Time and Majora’s Mask were some of my first games ever, and if hours of being hopelessly lost in desperation with no idea of what to do doesn’t build character, what does? Again, persistence and a drive to eventually find the answer builds beneficial qualities in its players. I think that I can attribute my playing of Zelda while growing up to be what developed me into a creative person that thinks a lot. Thanks to Zelda’s open ends, a whole new world of theorizing, like no other game series, is available. How many of us are writers, and even somewhat philosophers (okay, just ‘deep thinkers’) because of that? There’s at least several dozen here at Zelda Informer alone. Most of the time people overlook this next benefit of Nintendo gaming, or maybe people just take it for granted. We try to think up all of these flashy benefits and forget to look at games for that they are – an entertainment medium. So then, potentially the biggest benefit of gaming is how it provides an escape from stress. A chance for people to cut back, have some fun and not worry about their problems. We often get too caught up in reviewing and critiquing, forgetting to remember that games simply give us enjoyment and make us happy. I love having a relax with Wii Sports, Pokémon or Mario Kart. If its competition you want, look no further than Brawl or GoldenEye 007. However you get your kicks, Nintendo has got you covered. Adventure – try Zelda. Platforming – try Galaxy. A challenge – try Monster Hunter Tri. The great thing about so many of these games is that they never get old. They continue to be fun. Mario Kart 64 is a prime example of a game that will never die. A game that will never grow old. Gaming is a hobby, something we do because it makes us happy. It makes us feel good, sometimes when nothing else can. Whatever your style, your gaming desires, Nintendo has such a variety that everyone can just kick back and enjoy life the way they want. And while gaming is a release from the world around us, it can be at the same time a big reality check that immerses us right into our problems and struggles – not in a bad way mind you. As a commenter said on this article’s prequel, ‘there has not yet been any mention of The Legend of Zelda’s moral overtones’; well here it is, just for you. I’ve said it innumerable times, but gaming provides inspiration and guidance for our lives. Woven throughout many games, and none more prominently than The Legend of Zelda, players will find themes and messages to take away with them. Everyone gets something different from the experience. Someone playing The Wind Waker may warm to the concept of the simple villager becoming the world’s hero. Others will be moved by Daphne’s plights of regret, while others will learn from the coveting of Ganondorf. Games are stories and experiences created by humans (shocking, I know), so all throughout are human emotions and motives that we can relate to. Whatever the reason may be for you playing Nintendo games, there’s no doubt that you come away with much more than you ever intended. Yes, there’s the experience, but there’s also the themes and personal development that come with it. No-one brings the benefits of socializing and getting active while gaming better than Nintendo does, and they’re all advantages that you take away regardless of why you were playing in the first place. If the story and themes were what you are after, you get a fun experience too. It’s win win. Nintendo makes gaming interactive, social, developmental, fun and inspiring. 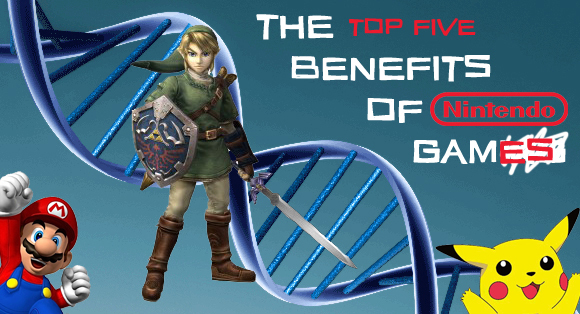 These are my top five benefits of Nintendo games for you. It’s no wonder that I choose Nintendo.